This page is an archive of previous club operating events. 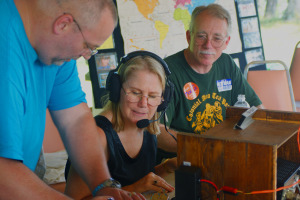 Delegate Brenda Pogge makes contact during ARRL Field Day 2010 with the help of Dave NM4M. Dan WG4F and George K2QIJ helping string a rope in a tree to hang an antenna for Field Day 2010. The fourth full weekend in June of each year is the time for Field Day. Until 2014, WAARC used an area on the Chickahominy River at the end of Brickyard Road off of Forge Rd, near Toano, Virginia. However, in 2014 this piece of land was no longer available for the club to use because of impending development. Information about WAARC’s new Field Day site can be found on the Field Day page. 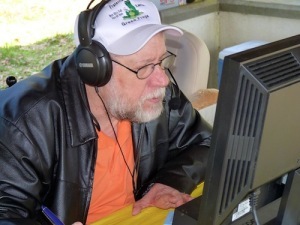 I would like to take this opportunity to thank all that came out to support our efforts for the 2011 Virginia QSO Party at the “Brickyard” this past weekend. The weather was actually nice, but a bit colder than we expected, especially up on the hill, in the shade. But never the less, it was a great experience. We made 274 contacts, covered more than half the Virginia Counties/Cities and many states. 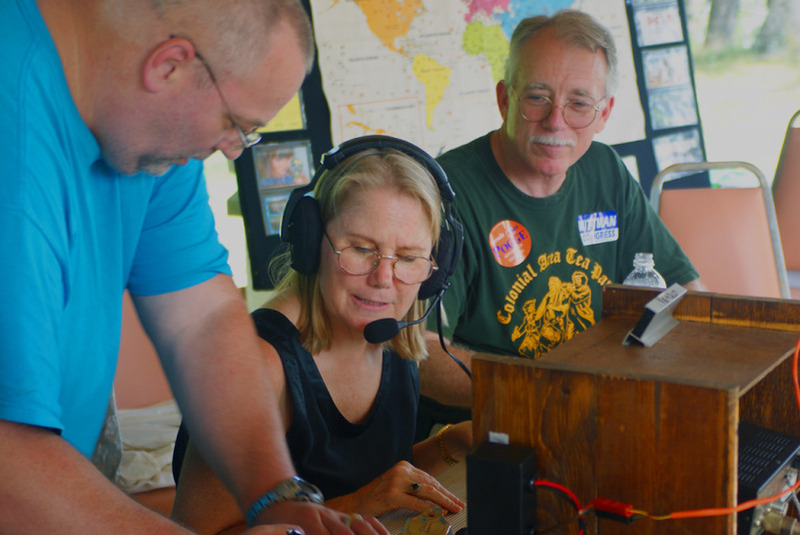 We talked to some of our friends such as Jerome (K8LF), who was working with one of the Northern VA club stations, Dan, (WG4F) working from home, and G. Marsh (K4GAM) also working from home. We had a great time chasing some mobiles and portable stations. One mobile duo worked us 5 or 6 times, as they rolled across southern VA. I have noted the following people who came out and operated or logged. If anyone else sat down at the radio/computer, please contact me as I want to be sure all operators/loggers get included in the log when sent in. On Saturday, we also had a lot of folks who came by to provide moral support and just see what the heck we were doing. On Sunday, we were mostly ‘workers’ although, a friend of George’s from the Haven stopped by and chatted for a while. Ron is a recent General Class license holder and is interested in joining WAARC and participating in our events. He and several of Saturday’s visitors were interested in the setup and antenna. On that note, the setup was simple, I had my K3/P3 out with my laptop. We used commercial power as there is no penalty for this on the QSO party. The antenna was my light-weight 80 meter doublet as an inverted ‘V’ using a 31 foot ‘Jackite’ pole in the center. Don’t have one end of the antenna too near (about 18 inches) the ground. We initially had high VSWR and after elevating the low end of the antenna, that problem eased up. Along with the item above, we also changed the coax from the BALUN. Lengthening the coax jumper also helped to lower our VSWR on the antenna. Make sure that ALL the connections are secure. Some erratic VSWR readings ceased after we moved the power cable resulting in a total shutdown of the radio. We discovered that one of the leads connected to the PS wasn’t rally tight. A quick adjustment with a screwdriver and this trouble went away for the weekend. Make sure the antenna mast is well guyed and secure before you turn your back on it. We obviously didn’t have quite enough tension on the feedline side and the mast fell over, folding it about 10 feet from the top. We removed the broken section completely and moved the antenna down just below the ragged ‘top’ and put ‘er back up. After some thought and discussion, I think I can salvage the mast and regain almost all the lost height, may lose a foot or slightly more. One other cool idea was provided by Chuck White (AI4WU). On Sunday, he brought out a spare flat screen and we set it on top or the radio. This allowed the logger to have the computer to himself, and the operator had is own monitor to look at. It was real easy to look on screen and see the call already entered on the computer, and see the exchange serial number that you need to send without having to remember, or squint at the laptop screen to see it at the bottom. A real nice idea. May be a nice idea for FD. All in all, this was a great weekend and I hope everyone else had as much fun as I did. I think this should be included in our club events next year. I thought I’d share a few photos of our activities this past weekend during the VA-QSO Party. 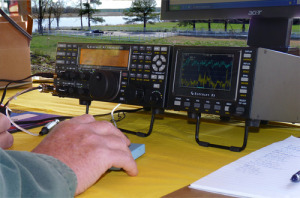 My club setup a station at our Field Day site in James City county, near Toano, VA (about 12 miles from Williamsburg). The site is on the Chicahominy River which enters into tye James River about 30 miles west of Hampton Roads and Norfolk. There are two nice picnic shelters on the property and we use them both for FD. For this even, we chose the one up on the hill and it gave us a nice location for the mast and a 135 foot doublet antenna configured as an Inverted “V”. My K3/P3 was setup under the shelter on the table and we used AC power and my Astron PS. 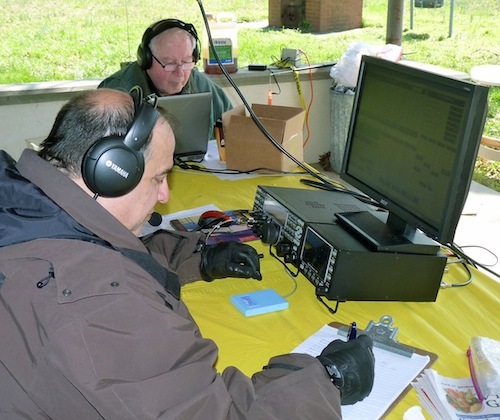 Below are some photos from the 2011 Virginia QSO Party. This photo shows the K3/P3 on the table. It also shows the bottom corner of the LCD monitor we placed on the radio to provide a view of the log as the data was entered by the logger at the end of the table (we were careful not to block the vents for the KPA3). The hand in the foreground belongs to John, AI4QQ, one of our operators. In this photo, Ed K1NUH is logging and Chuck AI4WU is on the mic. The little blue box under Chuck’s right hand is my home made PTT switch made from some surplus relay contacts and thin model aircraft plywood. I find this more convenient for portable operations then the usual footswitch. 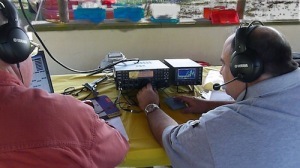 Ed and Chuck with the modified operating arrangement, with the radio/P3 with monitor on top from a better perspective. With this arrangement, the operator no longer has to strain to see the ‘exchange’ info or call sign while operating, it’s right in front of him. This photo illustrates the fact that if you want to do something bad enough, you can do most anything. George K4GAM is a disabled VET. He has limited use of his legs and numerous other problems as a result of his service in the ARMY in Vietnam. But he got his Technician and General tickets and has participated in our club special events as well as other portable operations. To his left you can see the seat-back of his “Jazzy” and just over his right shoulder, is the ball on the control stick. Well, we had a great time and made a lot of contacts. This is the first time the club has made an effort for the QSO party, but I don’t think it will be the last. By the way, from the coats and gloves you might guess it’s wasn’t Spring weather here, yet.